Here I proudly present my newest vector: "Truth within his Eyes"
I also want to thank my dear ryo-chan (lillaoryo704) for entertaining me and chatting with me during the whole time I vectored Athrun ^^ I can't wait to finally see your Kira vector <33 Athrun, here, belongs like ryo-chan's vectors to the new GSD collection! 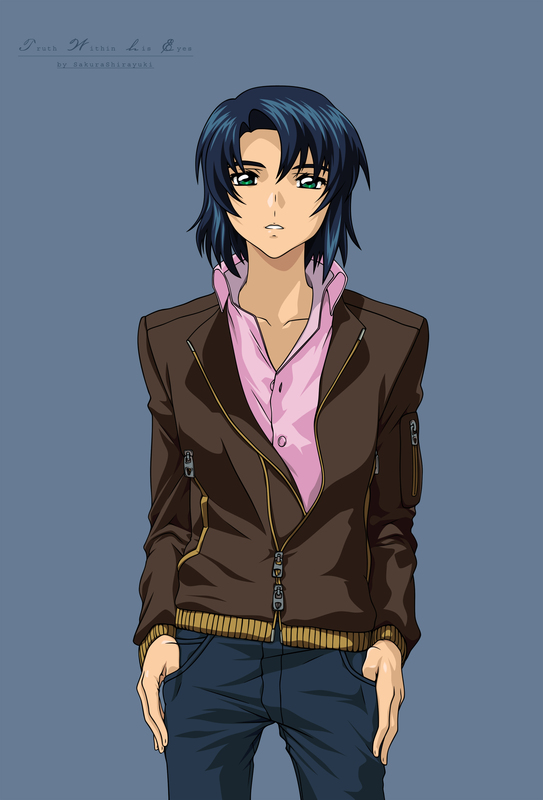 Perhaps you have noticed, I've changed the colors of Athrun's trousers! Seriously! Who wears LIGHT green trousers nowadays! I understand dark green ones cuz I also have a pair of it but not light green! I thought jeans would suit him better so his trousers became jeans! Yeah for jeans! The original scan is here to be found! Thx to gressini for sharing the scans with us! And last but not least pretty please with sugar on top give comments! yay awesome job, love the outline and the colors too, XD, awesome saku! I like the change in the colour of the pants, green doesn't seem to fit in with the pink shirt he was wearing. Yay, he's done! Nicely done work Sakura-san! You vectored him very well! His scan was my fave of all the guy ones! And I like how you changed his pants, they look better as jeans! Congrats on joining the GSD madness! Lol ^_^. Fave! great job on changing the color of his pants! Quote: seriously! Who wears LIGHT green trousers nowadays! Smooth lines, dark colors, neat work---this vector is just so awesome. I like the title too. It's very fitting for Athrun. Awesome vector of Athrun! He's like, the sexiest pilot ever to me XD Love his serene expression here, and the fact that you vector is darn gorgeous makes him looks 10 times better! Keep it up! I really like this vector it's very crisp and clean. Would it be all right for me to use this in a wallpaper? this vector is just wow!